In Relatively Speaking, four-time Oscar winner Ethan Coen and two-time Oscar nominee Elaine May join with Woody Allen for a one-of-a-kind Broadway experience directed by John Turturro. Julie Kavner, Steve Guttenberg, Mark Linn-Baker and Marlo Thomas head a cast of 16 in this hilarious evening of one-act plays that explore the often outrageous reality of relatives (each one-act play springs from a different branch of the family tree). So, what’s better than attending a performance of Relatively Speaking with a friend at the Brooks Atkinson Theatre? How about getting to attend a performance of Relatively Speaking with a friend for free, courtesy of Google Places and Stage Rush? What do you think, Rushers? Do you think Robert Creighton has navigated Broadway wisely? Which duet are you most excited to hear on his album—Kate Baldwin, Heidi Blickenstaff, Joel Grey, or Tituss Burgess? What did you think of Relatively Speaking and Sons of the Prophet? Leave your thoughts in the comments below! Families are complicated, and there’s a deep ocean of theatrical works that illustrate this point. We can add another hefty addition to that list with Relatively Speaking, a collection of three one-act comedies by Ethan Coen, Elaine May, and Woody Allen that examine the effects of familial kookiness in three different ways. “Talking Cure,” “George Is Dead,” and “Honeymoon Motel” feature a cornucopia of Oh yeah, that guy actors from TV and film, such as Marlo Thomas (That Girl), Steve Guttenberg (Three Men and a Baby), Grant Shaud (Murphy Brown), and Julie Kavner (The Simpsons). The three plays all maintain differing tones, but surely will feature someone that resembles a member of your own clan. Seeing a Broadway show is always an exciting experience. Seeing three in one night is what we call Broadway magic. 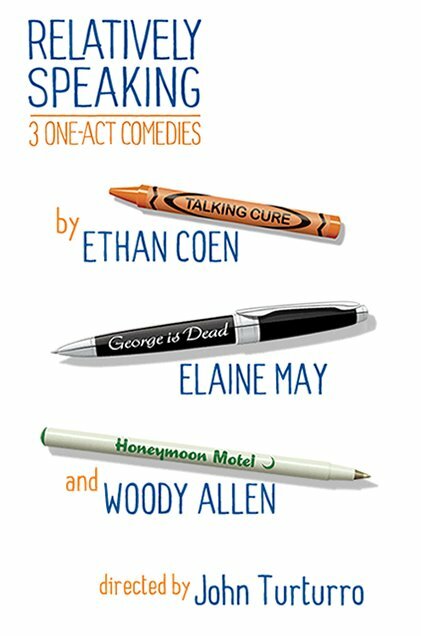 The new comedy Relatively Speaking has all that and more, comprised of three new one-act plays by Woody Allen, Ethan Cohen, and Elaine May. Stage Rush is giving away two free pairs of tickets to see this trio of plays about familial hijinks, which stars Steve Guttenberg, Marlo Thomas, and more! You can enter this contest one time via each method. So if you enter through Facebook, Twitter, and the newsletter subscription, you will have three entries in the contest. No more than three entries per person will count. If you play through Facebook, you must be able to be contacted via private message. If you play through Twitter, I must be able to direct message (DM) you (you must be following @StageRush in order for this to happen). The giveaway will end on Friday, September 30. I will notify the winners through email, Facebook, and/or Twitter private message. All participants must be able to see the show by October 19, 2011—Tuesday, Wednesday, or Thursday performances. The tickets are not valid for resale. What are you waiting for, Rushers? Get over to the Stage Rush Facebook wall, retweet us on Twitter, and sign up for the weekly newsletter—it couldn’t be easier! Tickets are provided by Relatively Speaking.